भवति भवार्णवतरणे नौका .. १४..
तदपि न मुञ्चत्याशापिण्डम् .. १६..
तदपि न मुञ्चत्याशापाशः .. १७..
मुक्तिं न भजति जन्मशतेन .. १८..
कस्य सुखं न करोति विरागः .. १९..
नन्दति नन्दति नन्दत्येव .. २०..
क्रियते तस्य यमेन न चर्चा .. २१..
कृपयाऽपारे पाहि मुरारे .. २२..
विश्वं त्यक्त्वा स्वप्न विचारम् .. २४..
ते पच्यन्ते नरकनिगूढाः .. २७..
देयं दीनजनाय च वित्तम् .. २८..
तदपि न मुञ्चति पापाचरणम् .. २९..
सर्वत्रैषा विहिआ रीतिः .. ३०..
द्रक्ष्यसि निज हृदयस्थं देवम् .. ३२..
नहि पश्यामो भवतरणे .. ३४..
Bhaja Govindaṁ was written by Jagadguru Adi Shankaracharya and is one of of his greatest composition. 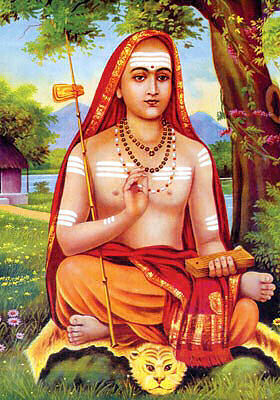 Shankaracharya is widely known for his teachings on Vedanta. He was born in the village of Kaladi, in South India, about 2500 years ago to his Brahmin parents, Sivaguru and Aryamba. He traveled throughout India during his life, preaching and establishing four important maths, or centers, and accepted numerous disciples. He had also composed a number of verses and hymns of his knowledge and insight. However, the Bhaja Govindam is perhaps his greatest. He is still today one of the greatest influences in the present-day understanding of Vedic philosophy, with numerous schools of thought throughout India still expounding his teachings. He primarily taught the non-dual, or advaita, form of understanding, teaching that everything is ultimately one. Many of the commentaries on the Vedic texts, such as the Brahma-samhita, the Upanishads, and others, are written with commentaries by those who follow his advaitic principles. Thus, many such texts have the impersonalistic sway to them, leaving out the idea that everything comes from a personal or Supreme Creator. However, before he left this world, he composed the Bhaja Govindam prayers that evokes the mood of devotion to Lord Govinda, Krishna. 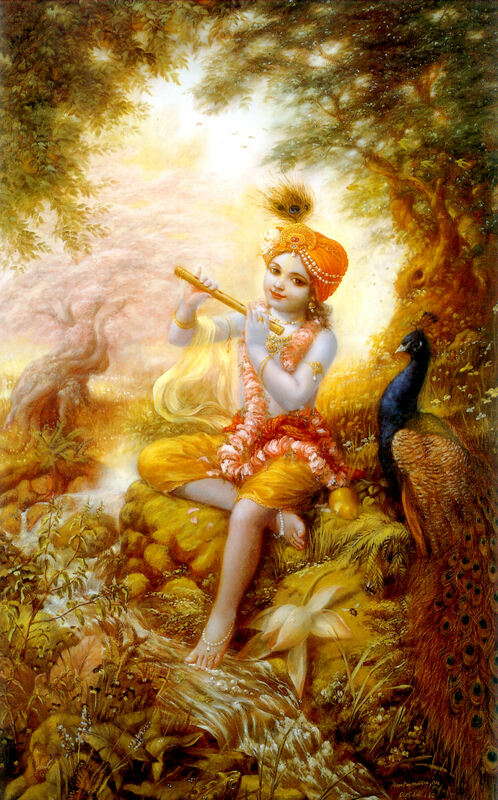 It is in this prayer that he emphasizes above all else the importance for developing devotion for Govinda/ Krishna, which is the principle means for attaining the Grace of the Supreme, and the freedom from further rounds of reincarnating in material existence. It is this prayer that leaves us no doubt that his final instruction was to give up our egotistical differences and surrender to Lord Krishna. It also encapsulates the sum and substance of all Vedantic thought in whatever other works that he had written. In the verses of Bhaja Govindaṁ, Shankara, like no other, explains our fallacies, our wrong outlook for life, and dispells our ignorance and delusions. Thus bhaja govindaṁ was originally known as moha mudgāra, the remover of delusions. Shankara explains, nay chides, us for spending our time in useless trivia like amassing wealth, lusting after (wo)men and requests us to discriminate and cultivate the knowledge to learn the difference between the real and the unreal, spirit and matter. To emphasise that, he concludes that all knowledge other than the Self-Knowledge is useless. Shankara makes the person realize how foolish he/she is in the conduct and behavior by these verses, and shows the purpose of our worldly existence, which is to seek Govinda and attain Him. Shankara's words may seem to be quite piercing and direct in this hymn, missing the softness and tenderness often found in his other texts. The reason is that this was an extempore recital to an old man, wasting his time. His words can be compared to a knife of a doctor. The doctor's knife cruely removes the tumor with much pain, but removing the tumor ultimately restores good health in the patient. So is Shankara's direct words, which pierce and point out our ignorance. It is a knife into the heart of worldiness, and by removing this tumor of ignorance, we can attain everlasting bliss by taking shelter of Govinda. 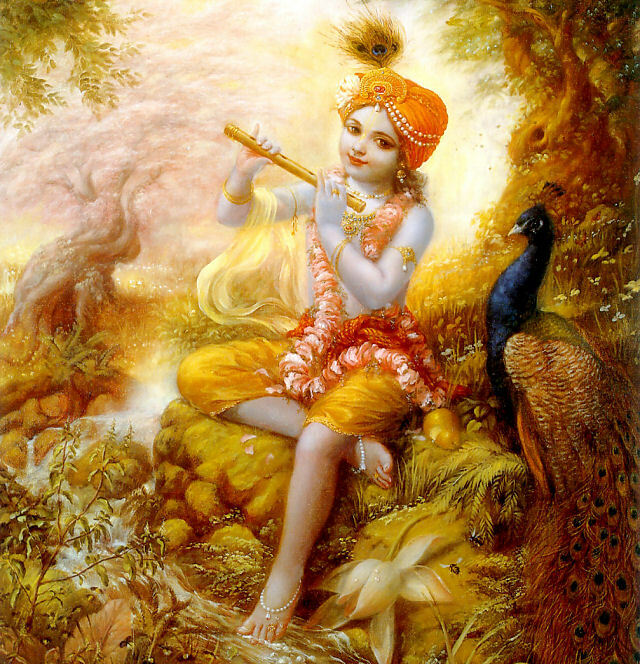 Bhaja govindaṁ has been set to musical tones and sung as prayer songs by children. It is divided into dvādashapaJNjarikā and charpaTapaJNjarikā for this purpose. The former is a set of verses (verses 1-12) while the rest of the verses form charpaTapaJNjarikā. Though sung as a bhajan, it contains the essence of vedanta and implores the man to think, "Why am I here in this life ? Why am I amassing wealth, family, but have no peace ? What is the Truth ? What is the purpose of life ? The person thus awakened gets set on a path to the inner road of Selfrealisation. Anyone who listens to the music of Bhaja govindaṁ is attracted to it . However, the significance of the text goes much deeper and contains a well defined philosophy of attaining salvation (Moksha) by taking shelter of Govinda / Krishna. May the achārayā guide us from ignorance to truth . OM tat sat. 'Sri Sankaracarya is Lord Siva himself.' Sri Sankaracarya is the spiritual preceptor of all the Vaishnavas and for this reason Sri Caitanya has acclaimed him as an acarya, great preceptor. 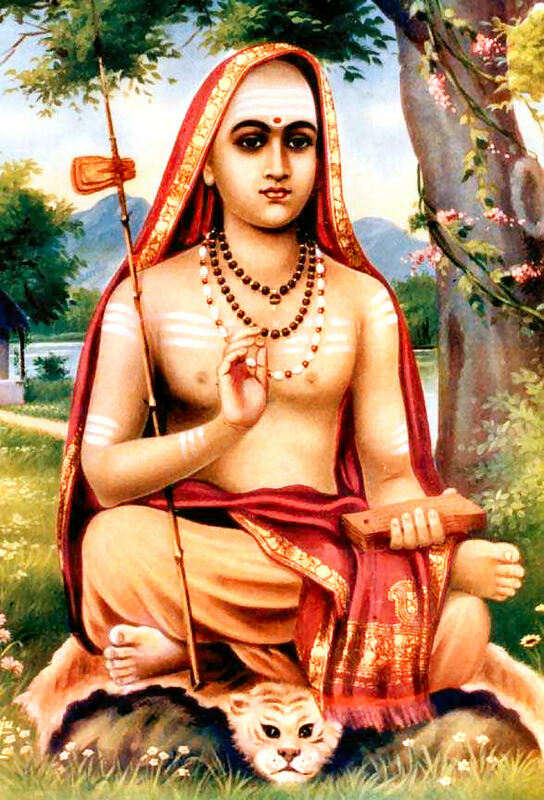 Sri Sankaracarya is a perfect Vaishnava.